J.B. Spins: Japan Cuts ’18: We Make Antiques! The tradition of pottery and ceramics dates back to at least 600 BC in Japan, where it remains a vital and respected medium for contemporary artists. You can see that for yourself from the exhibitions the Ippodo Gallery regularly stages in New York. You won’t come across the work of Sasuke Noda there anytime soon. He had that kind of potential, but he was ruined by an unscrupulous dealer. 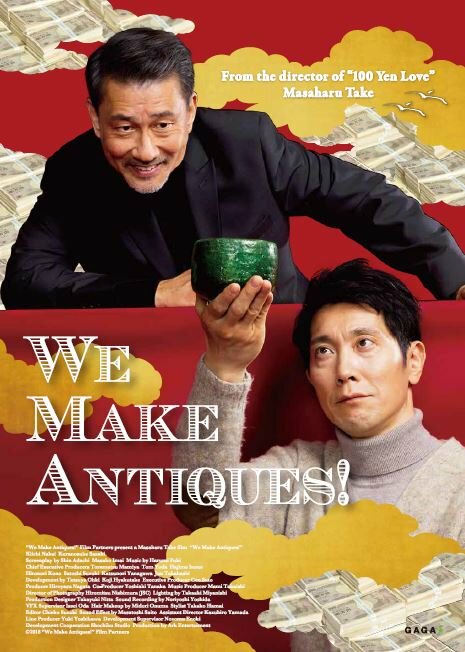 He now gets by on modest forgery scams, but he has a chance for some Sting-style payback in Masaharu Take’s We Make Antiques! (trailer here), which screens during the 2018 Japan Cuts Festival of New Japanese Film. Norio Koike is sort of like Lovejoy, but less ethical. Ever since the smalltime dealer was fooled by a forgery foisted on him by Tadayasu Hiwatashi and his dodgy expert authenticator Seiichiro Tanahashi, he forced himself to develop an eye for immediately detecting fakes, regardless of what the provenance might say. Yet, he still fell for Noda’s counterfeit Raku tea bowl. It turns out Hiwatashi and Tanahashi were also the ones who destroyed Noda’s reputation. Despite their awkward introduction, the two scammers quickly discover they are birds of a feather with mutual enemies. With the older gent’s network and dealer credentials, they can take the con Noda ran on Koike to a much higher level, like something in the neighborhood of 100 million Yen. (Actually, that is a few fingers less than a million dollars US, but it still fills up more than one briefcase.) They just need a more compelling fake Raku bowl. Yes, the con is on and it is indeed breezy fun. This is an amiable film with some low-key elements of farce. There is some door slamming and hiding under tables, but it never descends into slapstickery. In fact, the film genuinely has a passion for ceramics, which it wants to share. The patrons and staff of the Ippodo would probably get a big kick out of it, but fans of caper movies will also dig the scheming and scamming. Kiichi Nakai is delightfully roguish as Koike, the charming old rake. Watching him smooth talk his way through the picture is just good clean entertainment. Kuranosuke Sasaki’s Noda is rougher around the edges and more understated, but he nicely compliments Nakai. Kogan Ashiya and Masaomi Kondo make appropriately pompous villains, while a veritable rogue’s gallery of character actors add all kinds of color and energy as Koike and Noda’s assorted bunco accessories. It all goes down easy and even swings, thanks to the jazzy soundtrack composed by Harumi Fuki, including some epic drum solos worthy of Birdman. It is light and breezy, yet Nakai and Fuki still demonstrate virtuoso mastery of their respective crafts. Highly recommended for fans of con artist films, We Make Antiques! screens tomorrow (7/22) at the Japan Society, as part of this year’s Japan Cuts.